I am represented by Judith Murray at Green and Heaton. If you would like to sign up for my newsletter please click the button below - I promise to only send you relevant info and offers! Get involved... sign up here! 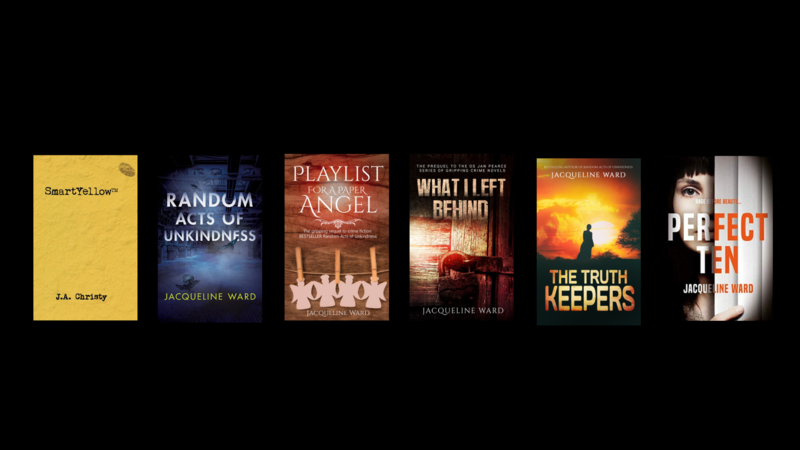 Jacqueline Ward is a freelance writer and psychologist. Her website is www.jacquelineward.co.uk. The aims and objectives of her freelance work are to write novels, screenplays and articles and to practice psychology and writing services. Jacqueline Ward may collect personal data through a newsletter signup via Mailchimp for the purposes of sharing information with those people who are interested in her writing and services. This Statement of Privacy applies to Jacqueline Ward’s website and governs data collection and usage. Any information collected by Jacqueline Ward may be shared safely and securely by the Mailchimp third Party App. Your details will only be shared with other reputable organisations (third-parties) for the purpose of delivering benefits such as offers, news and information about Jacqueline Ward’s writing and psychology services. The legal basis (EU General Data Protection Regulation 2018) for collection of your subscription personal data is consent. You chose to complete our Mailchimp sign-up form for contact at your request and consent. You may change your consent preferences at any time (as detailed below) and we are committed to keeping all data secure. If you supply contact details by another method and offer your personal data we will always ask for your consent to use it and you will be offered the same opportunities to change your preferences (as detailed below). Jacqueline Ward asks you to supply your personal data so that she can contact you as requested by you. Information collected from subscribers will only be used for the purposes of contacting for and supplying of information, a newsletter, news of events and webinars, meetings and other services connected with Jacqueline Ward’s work from time to time. Jacqueline Ward does not collect personal information by any ways that are not obvious to you and does not combine your data with external data. We do not use this information to profile you for sales targeting or any other purposes outside what you have agreed to by signing up to request information. You may change or delete your information at any time by contacting the Jacqueline Ward by email or post. We will make any changes as soon as possible, but within 30 days. You are able to unsubscribe from Mailchimp via the unsubscribe link in the footer. We are careful with your data, but if data is breached, we will inform you immediately. Jacqueline Ward protects the privacy of your information using a secure network and passwords. The information that you provide will be kept confidential and used to support your subscription. Your details will only be shared with other reputable organisations (third-parties) for the purpose of delivering your subscription. Otherwise, except for the purposes of law enforcement, regulation or legal proceedings, or with your explicit permission, Jacqueline Ward will not give or sell its subscribers’ and other contacts’ personal information to third parties. We operate an email mailing list program, used to inform subscribers about services, news and events. Subscribers can unsubscribe at any time in the footer of sent messages. The type and content of messages subscribers receive are those connected with subscription services only, as requested when signing up. Our sign-up process includes a separate consent tick box. Our third party service providers are; Mailchimp (Email), Eventbrite (Events and Webinars), Survey Monkey (Feedback) and ClickConnect (Webinars) and you can read their privacy policies on their websites. The information that you provide may be held and used by the Jacqueline Ward for production of internal reports, for allocating you to the correct information and for sending information to you about its activities, services and publications. You may change your preferences at any time by contacting us. Please see the section Changes to data and data requests and complaints if you would like to change your preferences. If you wish to buy anything from Jacqueline Ward’s website, you will be directed to and external payment area via a link. No payments are taken via the website directly and no payment details are stored by Jacqueline Ward. In addition, Jacqueline Ward uses Google Analytics, which records the pages requested from particular IP addresses using a small piece of code in the Web page. This allows Jacqueline Ward to see general trends, such as which areas of the site are popular, the most frequent paths that users follow, and so on. This helps to improve the site for you in future. Jacqueline Ward encourages you to review the privacy statements of websites you choose to link to from Jacqueline Ward’s website so that you can understand how those websites collect, use and share your information. Jacqueline Ward is not responsible for the privacy statements or other content on websites outside of Jacqueline Ward’s controlled website. There may be instances where our website features social sharing buttons, which help share web content directly from web pages to the respective social media platforms. You use social sharing buttons at your own discretion and accept that doing so may publish content to your social media profile feed or page. You can find further information about some social media privacy and usage policies in the Social media Policy on request. You must not share the password for your account for Jacqueline Ward’s contact signup apps. Your passwords are your responsibility, and must not be disclosed to any third party. This is important for your own protection and that of your personal data. If you access the Jacqueline Ward’s website from a PC that can be used by any other person, such as those at work or at college or in an Internet café, there are some basic guidelines to follow. Never leave the PC unattended when you are logged on to your account. Jacqueline Ward recommends that you do not use the ‘Remember Me’ logon option wherever PCs are shared and/or in a public place. If you suspect that your password or account information has been compromised, please inform us promptly and change your password. The privacy of subscribers and visitors is important to Jacqueline Ward. This policy will be kept under continual review, and changes may be made from time to time.